This all-steel tower is open 365 days a year. Take one of the two elevators up to the observation deck that delivers a 360-degree view that never fails to impress. But peering out at distant landscapes isn&apos;t all you can do. You can also get up close and personal by using one of the telescopes to zoom in on people, places and native wildlife. You never had a history lesson like the one offered by the Gatlinburg Space Needle. The Higher Learning program takes you to the observation deck, where – using a special viewfinder – you&apos;re shown the way the area looked in days past before city lights replaced the cornfields. Not all the attractions at the Gatlinburg Space Needle are located 400 feet above ground. At the base of the Needle you&apos;ll find Arcadia, the town&apos;s largest family-fun arcade center. More than 100 arcade games tempt players of all ages. Here&apos;s where your skill and luck earn you tickets to exchange for great prizes and souvenirs. Play as long as you like, then kick back for a slice of New York–style pizza at Arcadia&apos;s Flying Saucer Italian Bistro. What goes perfectly with Space Needles and pizza? Frozen custard or cheesecake (also available at the restaurant)! Want to conquer your corner of space? Lazer Runner, a sophisticated laser tag experience, takes place in a futuristic arena on the Space Needle complex. Dressed in a space-aged, fibre optic battle vest and armed with a light-piercing phaser, you&apos;ll be surrounded by black lights, fog and amazing special effects as you battle your way through a challenging maze. Will you come out victorious? Kids and adults alike find Lazer Runner great fun, and you can purchase discount tickets online. The Space Needle and Arcadia boast some of the most unusual performers in the Smokies. The onsite Iris Theater hosts attractions including mentalist Bill Gladwell, whose show, "Head Case," will astound you by combining safe hypnotism with showmanship to influence people&apos;s thoughts and words. From mind-blowing to hilarious, "Comedy Hypnosis" with Guy Michaels lets you become the star as members of the audience are hypnotized with some wildly funny results. Prefer to just sit back and observe? Will others cluck like chickens? Speak with strange accents? Dance like ballerinas? You&apos;ll laugh till it hurts as the audience becomes the entertainers. Before you head home, you&apos;ll want to save some time for "A Brit of Magic" with England&apos;s Keith Fields. This interactive show fuses magic, comedy and stunts to amaze and amuse your entire family. If your visit falls during December, there&apos;s no place better to be than Gatlinburg&apos;s biggest New Year&apos;s Eve party. The Space Needle delivers the area&apos;s largest event with a midnight ball drop to usher in the New Year. But the fun doesn&apos;t stop there. Once 2015 has arrived, the party really gets started, with a huge, choreographed fireworks and pyrotechnics show, live band and dancing till dawn. The Space Needle offers a variety of specials, coupons and other promotions to make your visit as affordable as it is fun. The Star Treatment package includes two adult admissions and free viewfinders, plus laser tag passes, a ride on the Hurricane Simulator and $10 in tokens to use as you wish. This $45 value is offered online for $29.99. For families, Family Day/Night Pass offers great savings. Two adults and two children can make two visits to the top of the Needle – one during the day, the other at night. Special admissions for children, seniors and adults are available online, and children under age 4 are admitted free. 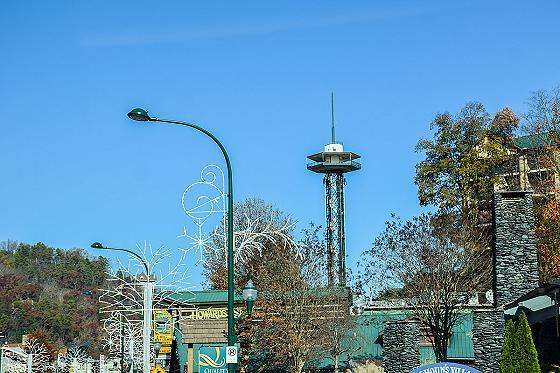 The Gatlinburg Space Needle isn&apos;t hard to spot – just look up. Located on Historic Nature Trail, the attraction is convenient to downtown Gatlinburg and Pigeon Forge. Accessible roads, plenty of parking and public transportation will get you to the Space Needle from your hotel, cabin or condo. Plan your visit to the Smokies of Tennessee today and reserve time to explore everything the Space Needle has to offer. From panoramic views and hilarious entertainment to family-friendly parties and fun learning experiences, it&apos;s one attraction that will keep you coming back again and again.